The Taiwan Season is now an established feature of dance on the Fringe but its performers are not the only representatives from the island in this year’s festival, Beyond Beauty, Our Country Taiwan (五行薹灣) being presented by a small group from the Graduate Institute of Performing Arts (表演藝術研究所) at Taipei’s National Taiwan Normal University (NTNU, 國立臺灣師範大學). As the title suggests, the work is a celebration of the life and culture of the island, told through dance and projections. In a country as diverse as Taiwan, rich in history and tradition but equally very modern, you can never cover everything in 45 minutes, but the show does a fair job at sketching an overview. The choreography is pleasantly appealing without taking any chances, and neatly performed (NTNU is an institution for teacher training rather than professional artist training). As a whole, the show will bring back memories to anyone who knows the island, and in that sense, I found it quite heartwarming. Beyond Beauty, Our Country Taiwan is a work of multiple sections, most of which themselves have distinct segments, some of which are very short, most notably some dances with fans. The dance is largely an abstracted response to ideas, the best moments invariably the longer ones where ideas are allowed to develop. Everyday things are sometimes hidden in the dance. One moment references strap hanging on local buses. An excellent few minutes takes inspiration the green walking man seen on pedestrian signals at Taipei’s intersections (and who actually appears to run as the count down to red approaches zero). It’s an old choreography truism that less is often more, and a poetically calm interlude is provided in ‘The Culture of Blessing’ section by a lovely, simple, sequence involving a white cloth held between the two performers, Doxa Liu (劉芮慈) and Huang Wei (黃暐). Actions that are mimed come across much less well. Some of the projections work well with the dance but some seem to bear little connection with the movement in front of them. Those in the ‘Culture of Food’ section take over completely, mainly because the way each food item shown (beef noodles, Taiwanese sausage with rice, stinky tofu and so on) unfolds demands full attention, taking it away from the dancers totally. The music is of that unfortunate sort that one might find accompanying a wordless travelogue, which I accept, in a way, is what this is. But it has no context. It could equally be set to a dance about Scotland. How I wished for something more relevant, something with a more traditional air for the Chinese dance influenced sections, or traditional or contemporary sounds, or even Taiwanese popular music. On the whole, the creative team do a good job of adapting to the tiny Paradise in The Vault stage, barely 4 metres square. There are just a few moments when they try to squeeze too much in, and when it feels crowded, even with just two performers. Finally, and going back to food, it’s the first production I’ve ever been to that gives free bubble tea to the audience afterwards. Top marks for sure! 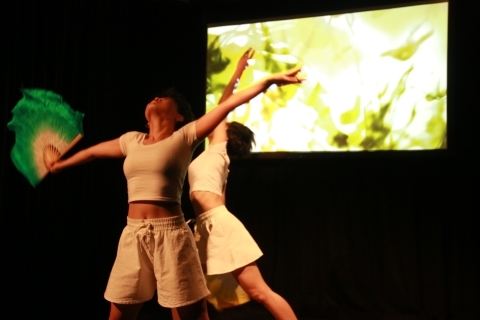 Beyond Beauty, Our Country Taiwan continues at Paradise in the Vault to August 11. Visit https://tickets.edfringe.com for details.